Advanced Applications in Manufacturing Engineering presents the latest research and development in manufacturing engineering across a range of areas, treating manufacturing engineering on an international and transnational scale. 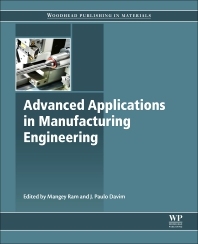 It considers various tools, techniques, strategies and methods in manufacturing engineering applications. With the latest knowledge in technology for engineering design and manufacture, this book provides systematic and comprehensive coverage on a topic that is a key driver in rapid economic development, and that can lead to economic benefits and improvements to quality of life on a large-scale. Manufacturing engineers, postgraduate students and researchers in engineering; engineers; research scientists involved in manufacture engineering; and professionals and researchers involved with policy making. Mangey Ram is currently Head of the Department and Assistant Dean (International Affairs) at Graphic Era University, India. He is Editor-in-Chief of the International Journal of Mathematical, Engineering and Management Sciences, as well as Executive Associate Editor of the Journal of Reliability and Statistical Studies. Prof. Ram has published 77 research papers and presented his works at national and international conferences. His research interests are in reliability theory and applied mathematics.